The inauguration of George Washington as the first President of the United States on April 30, 1789, was a public event witnessed by a cheering crowd. The celebration in the streets of New York City was also a very serious event, however, as it marked the beginning of a new era. After struggling with the Articles of Confederation in the years following the Revolutionary War, there had been a need for a more effective federal government and a convention in Philadelphia in the summer of 1781 created the Constitution, which established the office of president. 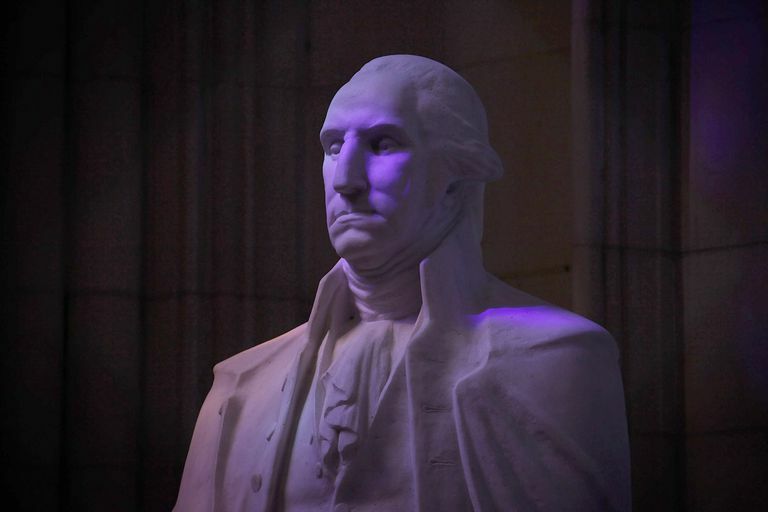 George Washington had been selected as president of the Constitutional Convention and, given his great stature as a national hero, it seemed obvious he would be elected as the first President of the United States. Washington easily won the first presidential election in late 1788 and when he took the oath of office on the balcony of Federal Hall in lower Manhattan months later, it must have seemed to the citizens of the young nation that a stable government was finally coming together. As Washington stepped out onto the balcony of the building, many precedents would be created. The basic format of that first inauguration more than 225 years ago is essentially repeated every four years. After delays in counting votes and certifying the election, Washington was officially informed that he had been elected on April 14, 1789. The secretary of the Congress traveled to Mount Vernon to deliver the news. In an oddly formal meeting, Charles Thomson, the official messenger, and Washington read prepared statements to each other. Washington agreed to serve. He left for New York City two days later. The trip was long, and even with Washington's carriage (a luxury vehicle of the time) it was arduous. Washington was met by crowds at every stop. On many nights he felt obligated to attend dinners hosted by local dignitaries, during which he was toasted effusively. After a large crowd welcomed him in Philadelphia, Washington was hoping to arrive in New York City (the location of the inauguration as D.C. had not yet become the nation's capital) quietly. He didn't get his wish. On April 23, 1789, Washington was ferried to Manhattan from Elizabeth, New Jersey, aboard an elaborately decorated barge. His arrival in New York was a massive public event. A letter describing the festivities that appeared in newspapers mentioned a cannon salute was fired as Washington's barge passed the Battery at the southern tip of Manhattan. A parade formed consisting of a cavalry troop formed when he landed and also included an artillery unit, "military officers," and "the President's Guard composed of Grenadiers of the First Regiment." Washington, along with city and state officials and followed by hundreds of citizens, marched to the mansion rented as the President's House. The letter from New York published in the Boston Independent Chronicle on April 30, 1789, mentioned that flags and banners were displayed from buildings, and "bells were rung." Women waved from windows. During the following week, Washington was kept busy holding meetings and organizing his new household on Cherry Street. His wife, Martha Washington, arrived in New York a few days later accompanied by servants which included enslaved people brought from Washington's Virginia estate at Mount Vernon. The date for the inauguration was set for April 30, 1789, a Thursday morning. At noon a procession began from the President's House at Cherry Street. Led by military units, Washington and other dignitaries walked through several streets to Federal Hall. Keenly aware that everything he did that day would be seen as significant, Washington chose his wardrobe carefully. Though he was mostly known as a soldier, Washington wanted to emphasize that the presidency was a civilian position, and he did not wear a uniform. He also knew his clothes for the big event had to be American, not European. He wore a suit made of American fabric, a brown broadcloth made in Connecticut that was described as resembling velvet. In a small nod to his military background, he wore a dress sword. After reaching the building on the corner of Wall and Nassau Streets, Washington passed through a formation of soldiers and entered the building. According to an account in a newspaper called The Gazette of the United States and published on May 2, 1789, he was then introduced to both houses of Congress. That was, of course, a formality, as Washington would have already known many of the members of the House and Senate. Stepping out onto "the gallery," a large open porch on the front of the building, Washington was administered the oath of office by the Chancellor of the State of New York, Robert Livingston. The tradition of presidents being sworn in by the Chief Justice of the United States was still years in the future for a very good reason: the Supreme Court would not exist until September 1789, when John Jay became the first Chief Justice. "The Chancellor then proclaimed him THE PRESIDENT OF THE UNITED STATES, which was followed by the instant discharge of 13 cannon, and loud repeated shouts; THE PRESIDENT bowing to the people, the air again rang with their acclamations. He then retired with the two Houses [of Congress] to the Senate Chamber..."
In the Senate chamber, Washington delivered the first inaugural address. He had originally written a very long speech which his friend and adviser, future president James Madison, suggested he replace. Madison drafted a much shorter speech in which Washington expressed typical modesty. Following his speech, Washington along with new vice president John Adams and members of Congress walked to St. Paul's Chapel on Broadway. After a church service, Washington returned to his residence. The citizens of New York, however, continued celebrating. Newspapers reported that "illuminations," which would have been elaborate slide shows, were projected on buildings that night. A report in the Gazette of the United States noted that illuminations at the homes of the French and Spanish ambassadors were particularly elaborate. The report in The Gazette of the United States described the end of the great day: "The evening was fine—the company innumerable—every one appeared to enjoy the scene, and no accident cast the smallest cloud upon the retrospect." What Was the First U.S. President's Foreign Policy Stance?